For a long while I've only ever handled or shot guns, even technically possessed them. But now I have finally taken the plunge of being an 'evil' firearms owner. And so to show what I hope will be the start of many to come. 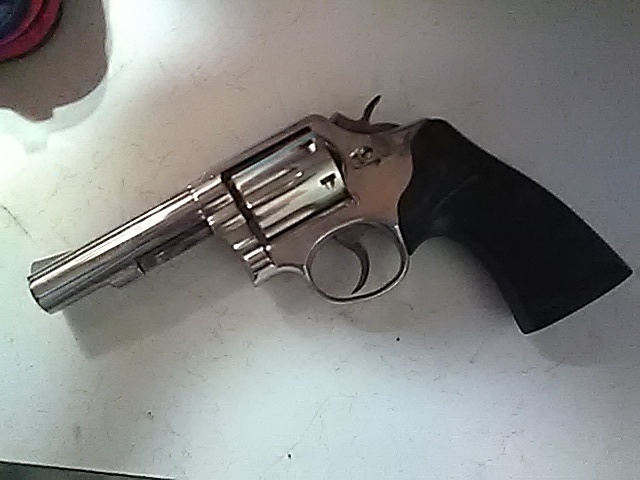 First, a Smith revolver. Always intended to make one of them my first handgun, and really couldn't ask for more. Was planning on a 686, but this boy was there at a damn nice price and for its age is still sharp and tight. The nickle finish is still quite solid. My idea of a fidget spinner. And I was lucky enough to then spot this about a hundred below the norm, all new in-box. Wasn't cleaned out so had to hit it up too. Just in case I have to go all Alternate 1985 Strickland on some slackers. A nickel plated Model 13. Very cool indeed. I agree. Hence why I got it. Everybody seems to enjoy it. Not that I'm planning to let go of it, at least not anytime soon - but still get a kick out of that. Nice start for some first guns Stan. Thanks, we all gotta start somewhere. I also agree that H&R is a nice little spinner as well. "..If someone has a gun and is trying to kill you - It would be reasonable to shoot back with your own gun." My 9mm Glock collection is finally complete*: I finally found a Glock 19 Gen 2. It's an LEO trade-in gun, so it has a bit of wear, but I'm happy to have it. It was apparently made during the 1994-2004 AWB, as it came with an LE stamped magazine. I'll post pics later. * No, I don't yet have the -43, the -45, the -17L, or the myriad variations of the 9mm models (i.e. any of the "C" models). But, at least I now have the four major 9mm model sizes: service (-17), compact (-19), carry (-26), and competition/tactical (-34), so I doubt I'll get any others. Cry "Havoc," and let slip the hogs of war. Not a complete firearm but I did score an 'A2 upper with an 11.5" barrel for my AR15 pistol. Originally it had a 5.5" flash suppressor seemingly pinned and soldered on. In sanding off the finish of the base of the Flash suppressor no pin was found. After cutting and grinding off the flash suppressor(Without fragging up the threads no less) it was discovered that it had been epoxied on. Upper then got a thorough cleaning as inside it was filthy. Once clean it passed a quick 20 round function test with flying brass. Removing the hand guard indicates that the barrel is a thicker 'A2 style to boot. It's official: After putting aside money from every paycheck for the better part of a year, I finally purchased a Geissele Upper Receiver Group Improved (URGI) just today, though I won't actually receive it until almost the end of the month. I'm finally going to start building my M4 Block III clone (yes, I know that it's still an unofficial designation right now, but I think everyone's expectation is that the URGI will become the basis of SOPMOD Block III). I'm planning to buy a new lower receiver instead of retrofitting the URGI to the lower from my DPMS AR-15 that I bought in 2010, so I'm taking recommendations on new late-2010s lowers if anyone has any. I saw on YouTube that Garand Thumb set up his URGI on a Radian lower, but I've seen mixed reviews in my research so far, so I dunno if I'll buy one of those. I do expect that, like him, I'll choose a B5 stock, though. Last edited by MT2008; 03-02-2019 at 06:55 PM. I just ordered a S&W Model 629 Classic. If I can get a second complete AR15 I am thinking one in 9mm Built by Sasquatch arms of Grants Pass. They are much cheaper than a Noveske and they are dominating the local firearms competitions.